LiveTwice has all your necessary medical and contact information a few seconds away, available 24/7. Securely upload all your test results, X-rays, scans and any other medical information to maintain a complete, detailed record of your health. Share your profile with your parents and trusted friends - just in case you don't have your card on you. Every day people receive incorrect medical treatment because of inaccurate or incomplete medical information. LiveTwice can help solve this problem. LiveTwice is a cloud-based service that provides essential medical information in the event of a medical emergency. Users’ emergency contacts, phone numbers of relatives and friends, blood type, allergies, conditions, organ donor membership, epilepsy & diabetes status and more. LiveTwice aims to reduce - if not eliminate - the statistic of people receiving incorrect medical treatment. Keeping your information up to date is not only crucial for your own survival and well-being, but easy with LiveTwice. Our goal is to not only help people of all ages get through an emergency, but also give them control over their own well-being and medical records. Times are changing, and maintaining a complete electronic health record is more important than ever before. Receiving the correct treatment is heavily reliant on what information medical staff are provided with. Share your profile with your parents and siblings for when someone needs to speak on your behalf . Save all your health data on our encrypted cloud server for better, more informed decisions and a clear picture of your health. Save your blood type along with your diabetes, epilepsy and organ donor status. Do you have allergies or conditions? Add your allergies, conditions, procedures, medications and supplementary notes to your health profile. Providing medical staff with a LiveTwice card will enable them to take care of you the way you deserve. Cubby cards and helmet stickers have a linkable LiveTwice ID on them that you can link to your main LiveTwice profile (ie., your LiveTwice card). When used, they display the same information your card would. The single pack includes a renewable 12 month LiveTwice subscription at R99.95 per year. Cubby cards and helmet stickers have a linkable LiveTwice ID on them that you can link to your main LiveTwice profile (ie., your LiveTwice card). When used, they display the same information your card would. 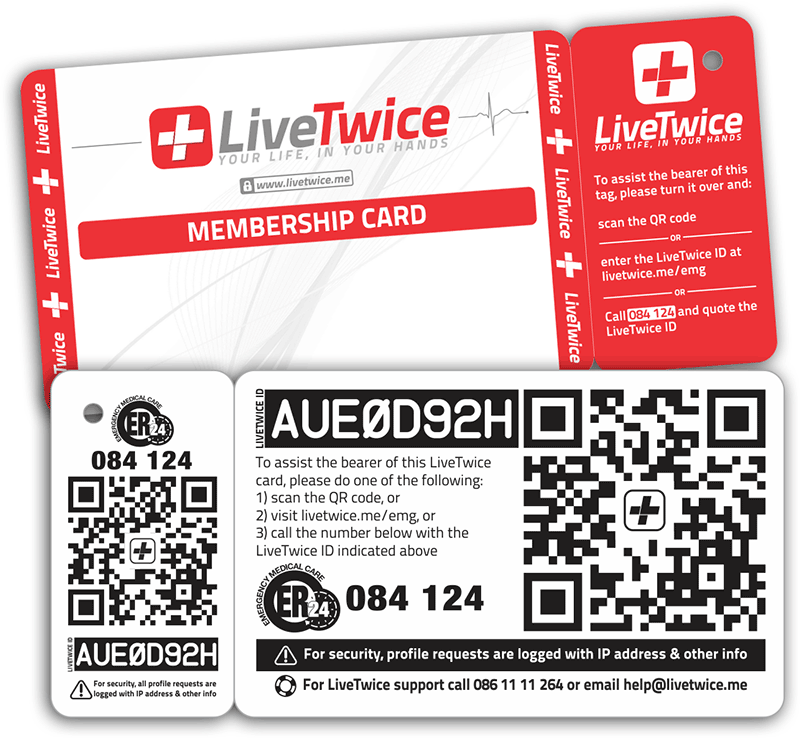 Each card in the family pack includes a renewable 12 month LiveTwice subscription at R99.95 per card per year. No? What would happen if you need a blood transfusion? Who knows your medical information? If you're unable to speak, who can someone ask about your medical information - and would they remember it? If you can't speak, letting first responders know what to do and what not to do will be up to LiveTwice. What happens if you don't know anyone attending to you - who do they call? LiveTwice will show them who your emergency contacts are. What hospital? Do you have medical aid? Don't end up at a state hospital - store your preferred hospital, medical aid details and doctor's particulars in your profile. What happens if your little one has been traumatised? Who knows all their details or who to call, or what their possible conditions are? And so do the trusted family and friends they've shared their profile with.